The Five EPs should be a mandatory record for any collection as an example of experimentation done right. In 1994, the United Kingdom had already started to become enamored with the trend that would define the ‘90s in Britain: Britpop. Oasis and Blur led the charge that would culminate in 1995 with “The Battle of Britpop” with singles “Roll with It” and “Country House”. At the same time, in the mid-‘90s, Disco Inferno, led by reclusive frontman Ian Crause, created two proper albums and the five singles and EPs that would be included on the bootleg The Five EPs. Their sound, characterized by extensive use of samplers attached to both guitars and drums and a driving melodic bass guitar could be compared to divergent sources from Joy Division to Talk Talk. Yet their most innovative LP, D.I. Go Pop was released to little fanfare due to the extent that Blur and Oasis dominated the pop charts. Britpop would eventually decline in the United Kingdom due to weak efforts by Oasis and the re-tinkering of Blur’s sound. However, by that time, Disco Inferno had stopped creating new music and was destined to be forgotten by the public and fade away. Enter American music critic Ned Raggett. 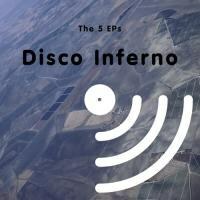 Reports says that the critic would personally burn copies of Disco Inferno’s The Five EPs to anyone interested in the record. It's unknown how many people were influenced by this bootleg record, but nearly 20 years after the making of Disco Inferno’s first EP, a proper release of The Five EPs has finally made it to the general public. This compilation, even more so than D.I. Go Pop, should be considered the group's masterwork, a journey through the mind of an innovative genius. Today, Disco Inferno’s sound still seems to have no clear reference. Bassist Paul Willmott’s playing is the melodic focus in many songs, much like Peter Hook’s bass in Joy Division and New Order, due to his refusal to attach samplers to his guitar. However, Hook was never surrounded samples of breaking glass, waterfalls, and chirping birds. Post-rock pioneers Talk Talk and Bark Psychosis are also name-dropped frequently when describing the Disco Inferno's sparse sound, but neither was as political or sounded quite as urgent. What resulted from the tinkering done by Disco Inferno was an innovative yet melodic band that was political and playful, brash and subdued, all at the same time. The best indicators of these qualities are the two songs on the compilation that would be most likely to have been pop singles in a perfect world -- the shimmering pop of “The Last Dance” and the psychedelically tinged “Second Language”. Neither these two songs could be considered inaccessible to the general public. “The Last Dance” is driven by bouncing synths that wouldn’t feel out of place in a modern dance-pop song, while “Second Language” sparkles with its lead guitar line. The only barrier to a pop hit is the lead vocalist himself; Crause, in his trademark style, partially sings and partially speaks most of the lyrics on both songs. Elsewhere on the record, traces of post-rock, post-punk, and noise-pop are seen. The diversity is evident from the shattering glass percussion on the nine minutes of “From the Devil to the Deep Blue Sky” to the use of the bass line of Iggy Pop’s “Lust for Life” (falsely) exuding joy on “It’s a Kid’s World”. Even the weakest tracks like “A Night on the Tiles” and “Lost in Fog” cannot be completely discarded as sound collages -- the carnival-like and dense atmospheres on them, respectively, encapsulate much of the Disco Inferno’s attitude towards music creation. So, what does this final product say of Disco Inferno? The result is a compilation that has been long past due. Disco Inferno was experimental, yes, but its creations never led the group to sacrifice a good melody. They were the rare band that managed to weave originality, melody, and intellectualism into a single package; it is unfortunate that they came about at the wrong time. Even 15 years after they broke up, there is very little that sounds like what Disco Inferno did. It’s hard not to be happy that this release finally came to light. Their own words in “Second Language” showed this optimism: “When all you've seen is people's pain / It's hard to feign surprise / And we just smile.” The Five EPs should be a mandatory record for any collection as an example of experimentation done right. For this, we have Ned Raggett’s tireless promotion and, most of all, Disco Inferno itself, to thank.